The UNI museum was established in the 1890s and is used for educational purposes by a number of UNI departments. It contains a wide variety of rare and unusual exhibits, including items of historical, geological and anthropological interest. Historical items include collections of weapons, coins, utensils, clothing and agricultural implements. The collection of pre-Columbian artifacts is extensive, and includes objects from both Americas. 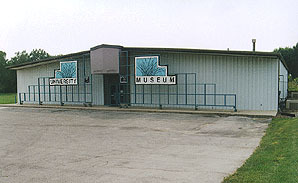 Items of special interest, such as a locally excavated mastodon tusk and items pertaining to the history of the University, are also housed here. The museum has a full-time curator and is accredited by the American Association of Museums. The collection is air conditioned and is cataloged both at the Museum and at the University Library. The Museum is open to the public Monday through Friday year-round, except for University holidays. Admission is free. Hours are 9 a.m. to noon and 1 to 4:30 p.m.
On selected Sundays during the fall and spring, the Museum sponsors special programs for the public on a variety of topics. A schedule of these programs is announced each semester. School tours of the Museum are encouraged. For more information, call the Museum office at 273-2188.